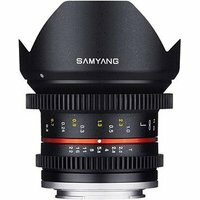 The Samyang 12mm T2.2 VDSLR is a manual focus, wide-angle lens designed for video use with the Fujifilm X range of compact system cameras. The focus gear ring is suitable for follow focus systems, and the decoupled aperture ring controls aperture quietly during shooting for precise operation. The bright T2.2 aperture represents the actual amount of light transmission to assist with accurate shooting and allows natural-looking shots to be captured, even in low light conditions. Samyang's new Nano Coating System (NCS) is used to provide the best quality image with low reflection. The lens features a minimum focusing distance of 0.2m and 6 aperture blades, designed to be almost a perfect circle when aperture is closed, to express starbursts clearly and beautifully.